From January 25th to 31st six thousand people will get together at the Centro de Exposições Imigrantes of Sao Paulo to discuss important issues about internet during the Campus Party 2010. Some of them are the new rules of copyright in Brazil, the national plan for broadband and the influence of social networks during the election campaigns this year. For one week, participants in the Campus Party move with their computers, bags and tents within the premises of the event. There are a complete infrastructure of services, leisure, health, safety, food and technology. 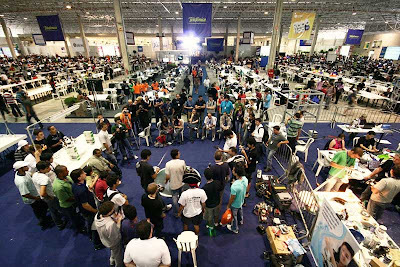 According to Marcelo Branco, event's director, "the Campus Party goes further than a platform of discussion of internet issues; it's a party, a camp party. This is the spirit we want to keep. It is a meeting place of celebration and fun". One of the debates scheduled for this year is the issue of "New Copyright Law". The idea is to create a dialogue between the entertainment industry and the Internet User. This one is the third edition and it has a project issued by the Human Rights sector, released this year. The National Department for Human Rights managed by the federal government has officially endorse the event and wants to discuss three topics: pedophilia on the Internet, where the idea is to encourage participants to create a campaign against child abuse using graphic elements. Another issue is education and the Internet, and the third one is a technological issue evolving accessibility and discussing how to include the uncountable number of disabled people within the technological segment. Scott Goodstein, the guru of the campaign of Barack Obama in the presidential elections, which will discuss policy in the Web. Kevin Mitnick, who was famous for getting unauthorized access to systems, often the toughest already developed in some of the largest corporations in the world. He will attend the opening ceremony and lectures with the theme "the art of deception." Marco Figueiredo, a researcher for 17 years inside the Center Goddard Space Flight, NASA. He will talk about free space exploration: developspace.net and the struggle for open knowledge. Lawrence Lessig, the founder of the Creative Commons. A professor in law school at Stanford and one of the greatest defenders of free licenses for the distribution of cultural goods and fair use. David Neeleman, who created the system of E-Tkts, a revolutionary idea for the aviation system. David implemented the Live TV (a live TV specially designed for the aircraft system) and was directly involved in Open Skies (company focuses on the management of revenue resources and reserves based on the internet). In 2008, created in Brazil the Blue Airlines, the company that exclusively uses E-Jets. When: January 25th to 31st. Open to visitors: January 26th to 30th, from 10am to 9pm and 31st, from 10am to 5pm (only for the Expo Area). Opening for campers: January 25th at midday. How much: For free to visit the Expo area. It is not linked to the entry into the Campers area. R$ 140 to get inside the camping area. 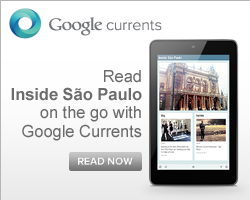 R$ 15 for camping (optional). The tip is the Power Pack (optional): R$ 165. Includes food service during the seven days of the event (food, drink and dessert). The service starts on January 25th with a dinner at 7pm, and ends with a lunch on January 31st at midday. How to get there: The best way is to take a subway. The closest one is the Jabaquara Station. Once there, take the corridor on the left straight after the exit point. At the end, is possible to get a bus, free of charge, organized by the event. It's also possible to go by car but it's necessary to pay for parking.